Helping reluctant teachers bring education technology into their classrooms starts with respecting their perspective. I think we need to stop talking about technology. When technophiles like me perceive that a teacher has refused our attempts to promote a new tool or app, we often assume that the person doesn’t want to learn, but the issue is likely more complicated than that. Education researchers Allan Collins and Richard Halverson wrote in 2010 that although technologies such as textbooks and chalkboards have long been part of education, those tools reinforced existing cultural and structural norms. Digital technology, on the other hand, fundamentally threatens the ideal on which educators base their identity: a single expert at the front of the room. Armed with mobile devices, students can learn anything, from anyone, anywhere, and at any time. This undermines the authority and control of the traditional teacher and can feel incredibly daunting. We should also bear in mind that a teacher may thoughtfully evaluate a use of technology within the context of his or her class and decide that what we’re promoting isn’t right for that context. A few years ago, an administrator asked me to observe several teachers in a 1:1 middle school. The most powerful class did not involve a single use of the students’ devices. Throughout the period, the teacher skillfully facilitated small group and whole group discussion. His students asked thoughtful questions, respectfully listened to their peers, and incorporated the class content. He chose not to use the devices so that he could engage the class as a learning community in different ways. With all of this in mind, I believe that we need to consider three essential questions when working with colleagues who are reluctant to use technology in the classroom. 1. What Is the Greater Purpose of the Technology? After my observation of the teacher who didn’t use the devices in his room during the period I observed, I didn’t recommend that he use them more often in class, much to his surprise. Instead, I suggested that he use them afterward. On several occasions, he had said, “That’s a great point to come back to,” but then he didn’t create an outlet for those conversations to occur. I showed him how he could use technology to expand the in-class conversation and empower more students to share their thinking. Too often, teachers feel bombarded by well-intentioned colleagues promoting various tools. 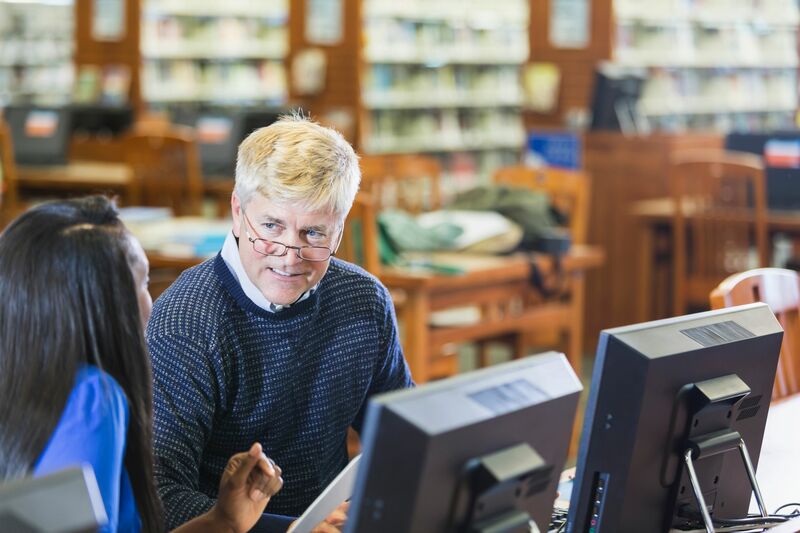 Instead of pushing technology as a panacea, a better approach might be to help teachers identify a problem to solve or a purpose to meet, and then show them how a specific piece of education technology can help. 2. What Are the Teacher’s Concerns? I once worked with a teacher who would shout, “No!” before I ever finished a suggestion. I assumed that she just needed to be persuaded, so I kept trying to find the perfect technology to bring her around. Think: How does this person understand their position in the school and their role within it? Feel: What is this person’s emotional response to the change/technology/idea and how it affects their position? Care: What are this person’s values, priorities, or motivations? What is important to this person? Had I worked through this routine, I would have realized that my teacher believed she was an expert educator in her content area and a leader in the faculty. Having to learn a new technology challenged how she perceived herself and how she felt others might perceive her. And she deeply cared about her students and her courses. In the end, I had to take a much different approach. It wasn’t enough for the teacher to understand the greater purpose of the initiative I was promoting—she needed to shine as a leader. When I approached her with a strategy that let her lead, she became a willing advocate. 3. How Can the Teacher Make a Gradual Shift to Technology? Finally, instead of trying to revolutionize or innovate or transform a teacher’s practice, imagine approaching with a suggestion for how to improve student learning. From this lens, the technology is no longer challenging the teacher but benefiting the student. For example, using a digital backchannel during a class discussion could empower students who typically might not contribute. Dedicating 90 seconds at the end of class for students to reflect on their learning via writing, text, audio, or video might help them make deeper connections to the content. Creating a digital space for students to share their wonderings or questions might lead to richer inquiry. These steps can make a difference for students, and they don’t require the teacher to overhaul their whole approach to teaching. When technophiles approach teachers with an understanding that their greater purpose in the classroom has little to do with a piece of technology and everything to do with supporting their students, they might have better luck leading those teachers to embrace a change.